Here is a follow up to a comment that was posted to my blog post “The T-Shirt Quilt Story”. In the article I say that I send a copy of an estimate/invoice which I create in QuickBooks (my accounting software) along with some drawings, etc., so that my customer knows what the charges are and what the finished quilt will look like. A quilter wanted to see what the estimate/invoice would look like. I have created a QuickBooks invoice for the quilt I described in the article. I would sign and date (today’s date) underneath this written statement. My customer would receive a copy of this estimate and I would keep a copy in the records for this project. I belong to several online, (group) email lists which are hosted at YahooGroups.com. 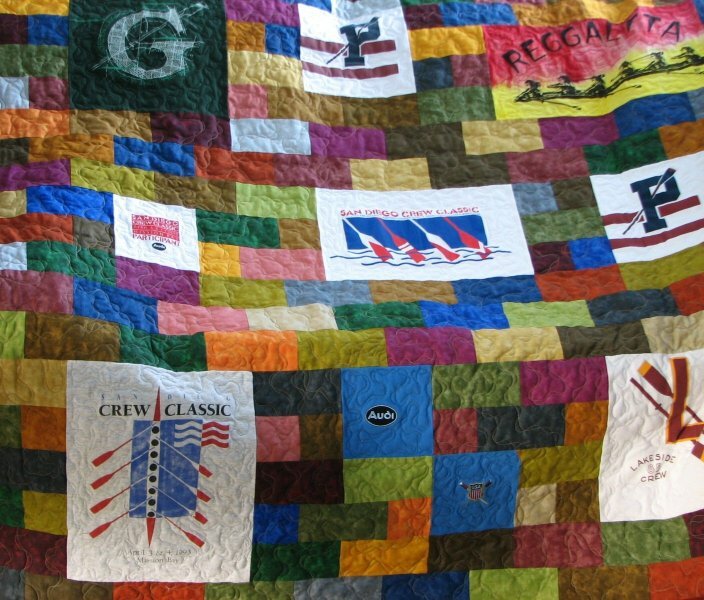 A few years ago I did a t shirt quilt for a customer who had ALL different sizes of t shirts, logos, etc. I started with a 3 x 6 grid and then determined which parts of the t shirts would go where on the grid. 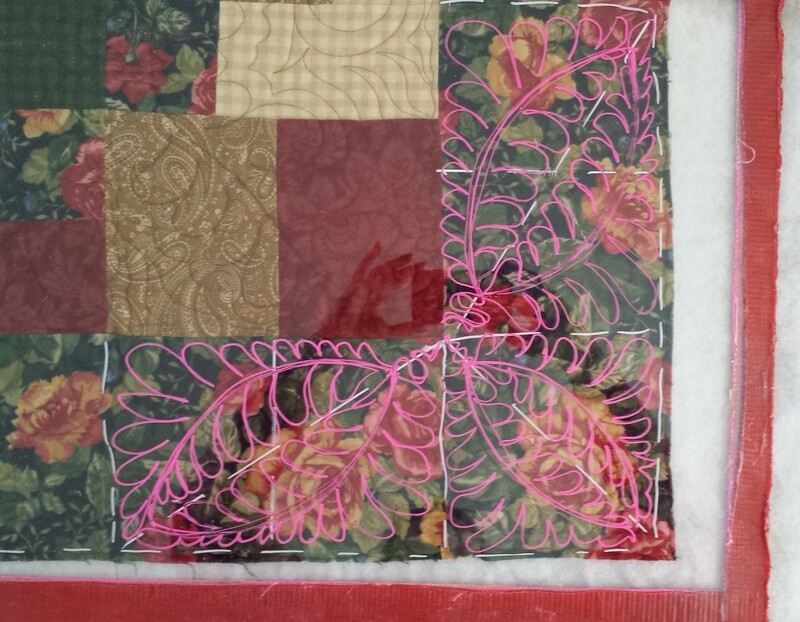 Then I cut assorted fabrics into 3.5 x 6.5 “bricks” and began building the quilt. Here are some photos of the T-shirt quilt I made, from start to finish. Click on any photo for a larger view. Of course, and there is a story behind this quilt. I would have to have the t-shirts within the next few days. I truly thought that my conditions would discourage the customer. Guess what? 48 hours later, my friend is at my front door with two HUGE bags of t shirts and a check for $700! I got the quilt made for Christmas along with a couple of throw pillows. Again, I got several positive responses from my post – and one FABULOUS response! With permission, I am posting the fabulous response I received below. Thank you for being so generous with sharing this sort of information. It is too easy for us to all undervalue our work. A car mechanic, or electrician would not think of working for the kind of low wages that many quilters charge. We are skilled craftsmen/woman. We to consider that we should make just $10.hr or less in some cases is just way out of line and not at all reasonable. We have over head and years of experience to consider. Even someone new to longarm work most likely has years of experience in sewing. We invest in our machine, dedicate a large bit of usable space of our home, we do research and pay association dues and engage in on going education. We cannot give our work away. I think it is important to educate new quilters so they can educate their clients. I just don’t understand how some customers can readily pay $60 – $100 per hour for some work and then expect to pay so little for skilled work.. and in many cases artistry! now that I have gotten on this soap box, I might as well let it all out.. I find it down right offensive that essential services like dental care (that is one of my pet peeves) can amount to even $900 per hour! I find that even immoral! True the dentist has lots of overhead and years of training and support staff. But compare that to what we do – surely our training, equipment and overhead deserve to be considered. .. .. and not just getting by on what comes out to some minimal hourly rate. So… I say… do the very best you can. Always be improving your skills and do not be afraid to charge what you are worth! Gail – I couldn’t have said it better! Well thank you, and please do include my contact. 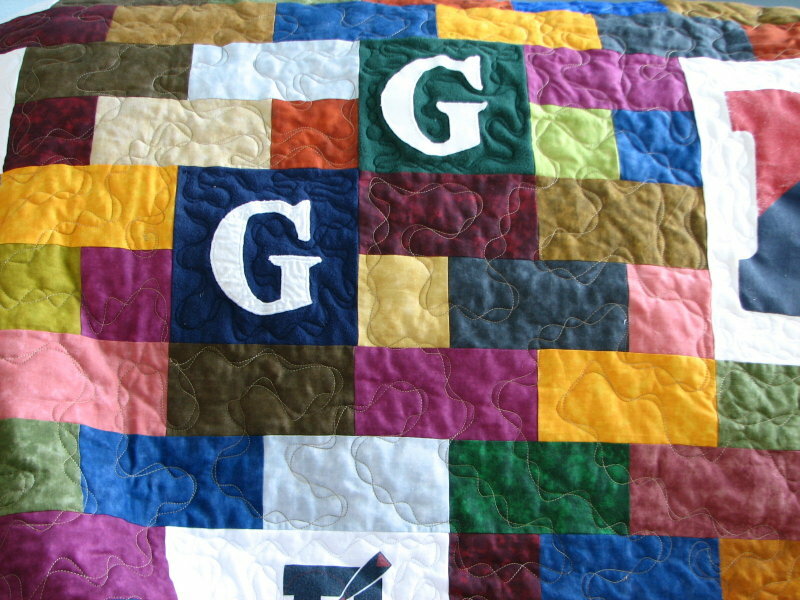 If you like you can include my websites at www.gailsegreto.com or www.facebook.com/QuiltingMemoriesEveryday if you feel it is appropriate. Gail, you have said exactly what I think! Both Gail and I would love to hear your responses to this post. Please feel free to leave a comment! Last month, I wrote about the hidden costs of having a machine quilting business. Have you have been keeping track of ALL your business expenses, as I challenged you to do last month? Have you totaled them up and are you surprised at how much they really are? First of all, take amount of your business expenses last month and multiply it by 12 (months) for a yearly total. Now, I know that this is not going to be an “exact” number, but it will give you a real good idea. Let’s say your total monthly business expenses are $500. Multiplied by 12 = $6,000 per year. For someone who has a full time machine quilting business, this amount, to me, seems reasonable. Remember, your business expenses may be different, and that’s all right. Now I want to break this number down to “business expenses per quilt.” To do this, you need to know how many quilts, on average, you quilt per month. For this example, I will assume that all the quilts completed are Queen Size quilts. Take the number of customer quilts you complete per month and divide that number into your monthly business expenses. if you complete 10 customer quilts per month, that is $50 per quilt. if you complete 12 customer quilts per month, that is $41.66 per quilt. if you complete 15 customer quilts per month, that is $33.33 per quilt. if you complete more or less customer quilts, your numbers will be different. What this shows you is that no matter what I/you charge for quilting, the first $50 – $33.33 per quilt is to cover your business expenses! Cost of your Quilting Machine – There is another part of the Cost of Quilting, and that is recovering the cost of your quilting machine. No, this is not depreciation or anything related to the IRS. (That is something you need to talk to you tax professional about.) This is simply a way of “getting back” the $$ you spent on your machine. $15,000 divided by 8 (years) = $1,875 per year, divided by 12 months = $156.25 per month. For easier math, I am going to round this number to $156. Now divide this number buy how many customer quilts you complete per month. On last thing to include in the Cost of Quilting is TAXES! You need to include taxes into the cost of quilting. These taxes are self employment taxes and other taxes that are not sales taxes. I am not a CPA or an authority on taxes and can not give specific information about your tax situation. This is something you NEED to talk to your CPA/tax professional about. For this post, I am going to include $15 per quilt for taxes. Let’s put all of this together! According to these calculation, it will cost between $80.60 – $58.73 in total expenses BEFORE the quilting process even begins! I encourage you to do the math with your own numbers and see how much your expenses REALLY are in your own business!